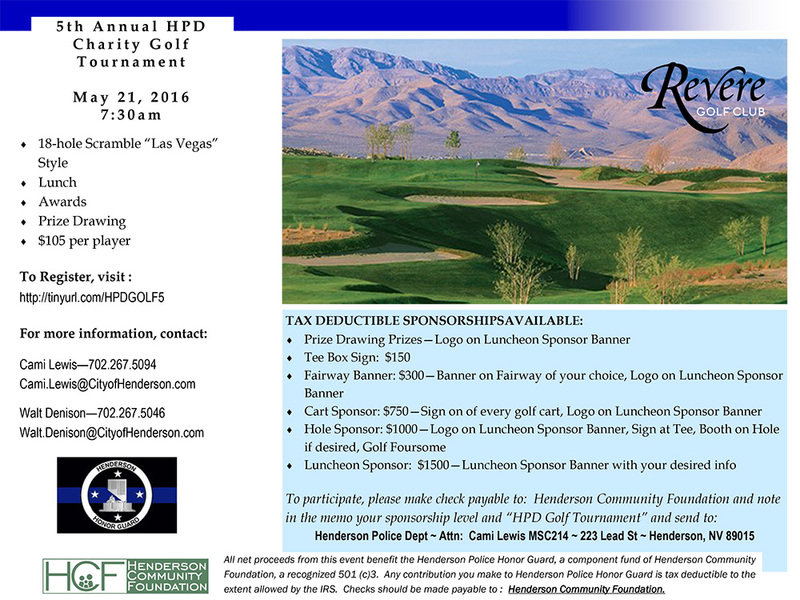 The 5th Annual Charity Golf Tournament, benefiting the Henderson Police Honor Guard takes place at Revere Golf Club, Saturday, May 21st at 7:30 am. The Henderson Police Honor Guard is a team of officers who honor those who have made the ultimate sacrifice. The Honor Guard is a volunteer role and the events they attend, uniforms they wear, flags they carry, equipment they use and the assistance they provide to families of fallen officers in the Henderson community are primarily funded through events such as this tournament. Your support allows us, with gratitude and respect, to continue to honor these fallen officers and their families. Put together a team and join us for this worthy cause! Register today at: http://www.tinyurl.com/HPDGolf5. Contact Cami Lewis with questions: 702-267-5094.